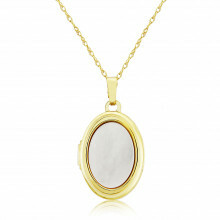 Long, oval shaped Locket in Gold with a fine trace chain which can be worn at 16" or 18". The front of the Locket has a beautiful carved Agate depicting a mother and child scene whilst the back has a plain polished finish. The Locket is hinged and opens to reveal a space to keep your personal memories, photograph or miniature keepsake. A truly special and meaningful gift, particularly for Mothers and Grandmothers.